Last, but not least. Found throughout northern Australia, the magpie goose is the last known species of its family, Anseranatidae. These large, unusual birds have been known to congregate in huge flocks, often numbering in the thousands. Unlike most waterfowl, magpie geese do not lose (molt) their flight feathers all at once, therefore they are never left flightless. Some researchers believe that this makes the magpie goose more closely related to screamers than are other waterfowl. Once also widespread in southern Australia, the magpie goose has almost vanished from there, largely due to the drainage of the wetlands where the birds once bred. Notice the knob. Magpie geese sport black heads, necks, tails, and wings. The head is topped with a noticeable knob, and the face is covered with naked, red skin. The beak is small with a slight hook at the end. The rest of the body is white, with orange feet and legs. The white areas on youngsters are gray instead of white, and they don’t have knobs. Females are smaller than males. Unlike most waterfowl, magpie geese have only partially webbed feet. This species’ scientific name, Anseranas semipalmata, even refers to those feet. The wetter the better. Rarely wandering inland, magpie geese are found in open wetland areas such as floodplains and swamps. Hang on! Typically found close to wetlands and rivers, magpie geese fly long distances, especially in the wet season. The magpie goose is the only goose in the world that can sleep in trees. They have a strong hind toe that provides a secure grip on branches. We’ll all have the salad. Magpie geese feed in large, noisy flocks of up to a few thousand birds. They congregate to feed on aquatic vegetation. Almost entirely vegetarian, these birds also consume blades of grass, seeds, bulbs, and rhizomes dug from underground using their hooked bill. Look out! Eggs and hatchlings are easy meals for birds of prey like the whistling kite, dingoes, snakes, and other small, terrestrial predators. Adults are hunted by humans, and the species is facing challenges from habitat loss due to extensive agriculture and the destruction of wetland. See what I’m saying? Vocally, magpie geese communicate in loud "honks." They also may get their point across by shaking their wings when feeling threatened or after squabbles with other geese. Three’s company. Pairs of geese mate for life, but a male may have two females that are usually related to each other. They breed seasonally at the end of the wet season (February through June) in the floodplains that they live in. Two females may occasionally use the same nest, which is almost single-handedly constructed by the male. Parent birds share egg-incubation duties, as well as raising the young. The species is also unique among waterfowl in that the parents feed the young bill-to-bill. Part of the Park. 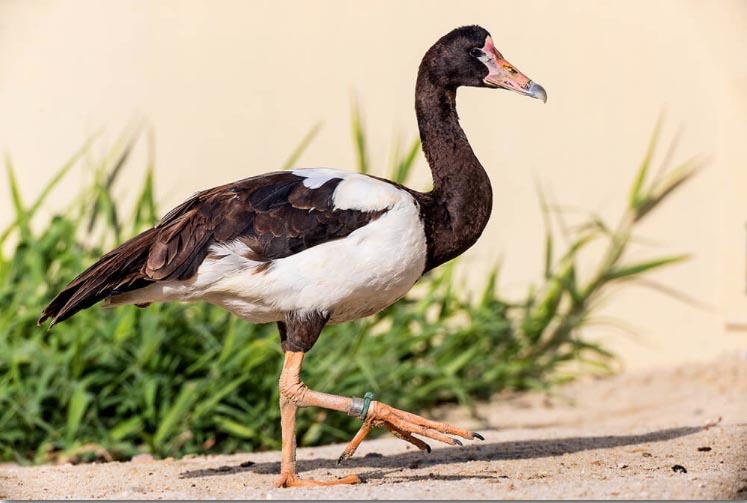 Magpie geese are part of the San Diego Zoo Safari Park’s new Walkabout Australia experience, which opened in May 2018. Save water and habitat! While the magpie goose is not listed as Threatened or Vulnerable, the ongoing draining of wetlands destroys habitat this bird needs to breed. You can support the conservation efforts of San Diego Zoo Global by visiting our Wildlife Conservancy at endextinction.org. The largest known magpie goose colony covered almost 18 square miles! Magpie geese have wingspans of almost 5 feet.